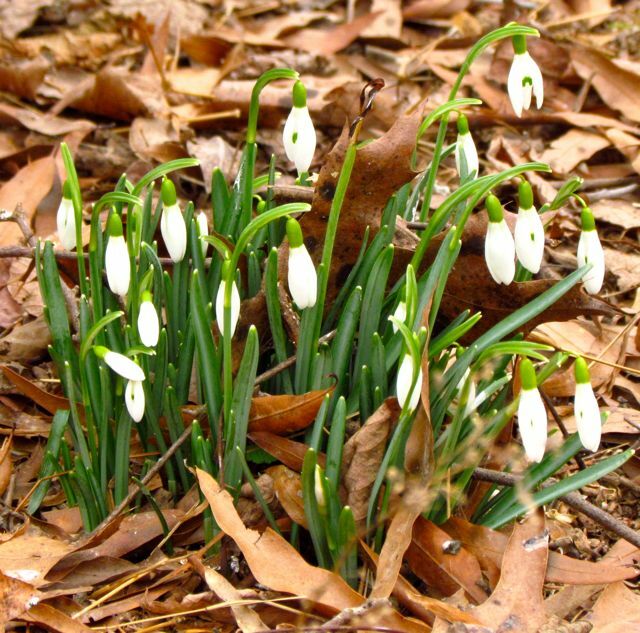 Snow drops signal spring’s imminent arrival. I love this time of year in my corner of the southeastern Piedmont. One morning, I can wake up to 14 degrees Fahrenheit and frost so heavy it looks like snow. Two days later, mosquitoes and moths beat at my windows, taking advantage of 60+-degree air. And through it all, the Spring Peepers chorus steadily from the swamp. Add to that the shrieking of female wood ducks when I unintentionally startle them as they paddle on the creek, Red-shouldered Hawks scolding me if I approach their nest too closely, and the cacophony of woodpeckers arguing over territory, and what you have, my friends, are abundant early signs of spring. Oh sure, we may still get a late snow storm or (please no!) ice storm, but that won’t slow spring’s progress for long. I have always loved sunrises, and they tend to be especially spectacular this time of year. I rise early and watch the chilly ones through my large south-facing windows. On warmer mornings, I stand outside, admire the colors, and enjoy the rising chorus of waking songbirds. If I’m really lucky, just as the sun tops the ridge line to my east, I am treated to the sea gulls. No, that’s not a typo, I meant what I typed. Even though I’m a couple of hundred miles from the NC coastline, every winter I see sea gulls. I think they’re Herring Gulls. They migrate inland for the winter and settle on the large man-made lake/reservoir that’s about ten miles or so (as the gull files) from my house. Every morning just at sunrise, these thousands of gulls fly from the lake to the area shopping malls, where they feast upon the garbage left by shoppers in the parking lots. They return to the lake in the evening, repeating the cycle daily until they decide it’s time to return to the coast. A couple of days ago, the gulls decided to steer their sunrise flight directly over my house. Wave after wave of gulls flew overhead in ragged V-shaped formations, the low rays of the sun illuminating their bellies and undersides of their wings. What seemed like an endless stream of brightly lit angels flew silently over my house for over five minutes. There must have been thousands of them. I don’t know if it’s because they are quite high up and out of my hearing range, or if perhaps they really do fly in silence, but their sun-brightened mute flight seems just right for that time of day. Raucous gull calls would definitely spoil the effect. It is a breath-takingly wonderful way to start one’s day. Alas, I was not awake enough to think to grab my camera. 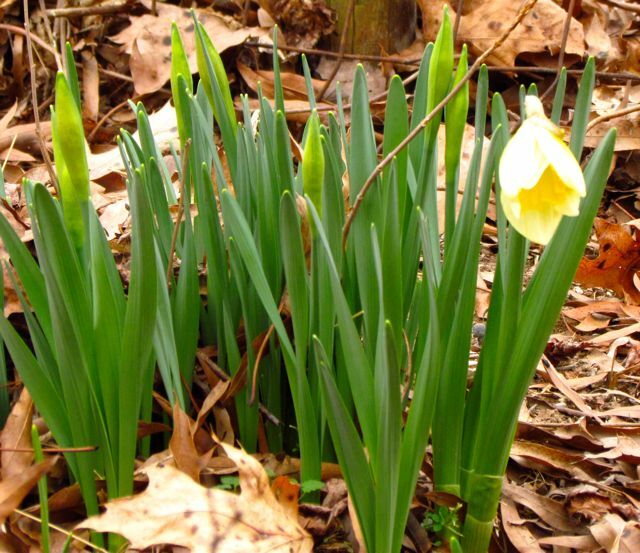 The daffodils are just beginning to awaken to spring’s distant call. I took advantage of yesterday’s mild weather to do a bit of yard work. I am far behind on outdoor chores, due to a self-inflicted injury on my right elbow. Some people get tennis elbow. I gave myself weeder’s elbow when I weeded my front bed vigorously for about six hours straight. (Memo to self: Aging elbows are much less forgiving than young ones.) After three full months of babying my cranky elbow, I’m now finally able to attack a few garden tasks. I started with some raking, followed by a few hours of dividing perennials and potting up some of the excess pieces. I’m helping a friend plant a new flower garden later this year, and I promised her some of my extras to help her get started. Garden books will tell you that perennials should be divided every three to five years to keep them actively growing and blooming. I’m sure that’s probably true, but I’ve found that most of my perennials are more forgiving than that, and thank goodness, because that’s a task I rarely seem to find time for. I ended up yesterday with 21 pots of varying sizes full of healthy offshoots from some of my perennials, including bronze fennel (seedling explosion in the veggie garden paths), daylilies, salvias, rudbeckias, echinaceas, anise hyssop, columbine, and catnip for my friend’s cherished felines. You can’t even tell where I chipped off bits to pot up, so overgrown are my enthusiastic plantings. 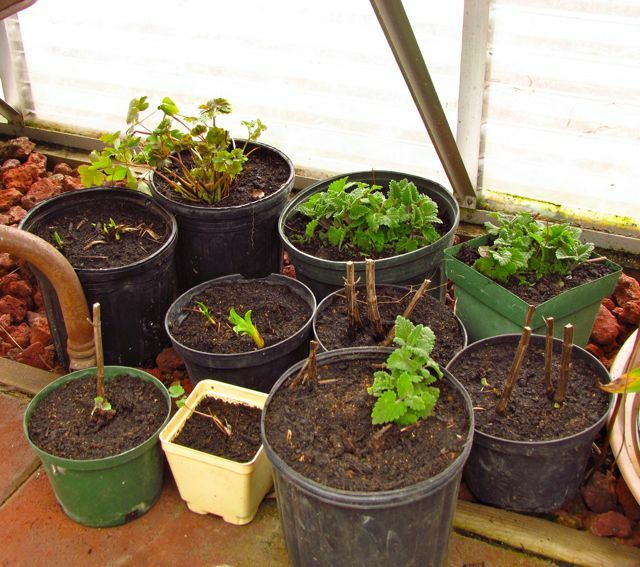 Pots of perennials settled on my greenhouse floor. The sad ones in front are little bronze fennel seedlings. They already look better than they did, so I’m hopeful they’ll recover fully. 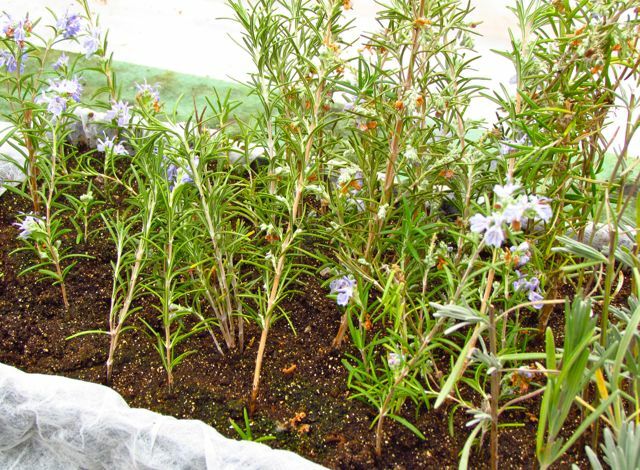 Rosemary cuttings are showing signs of healthy roots. 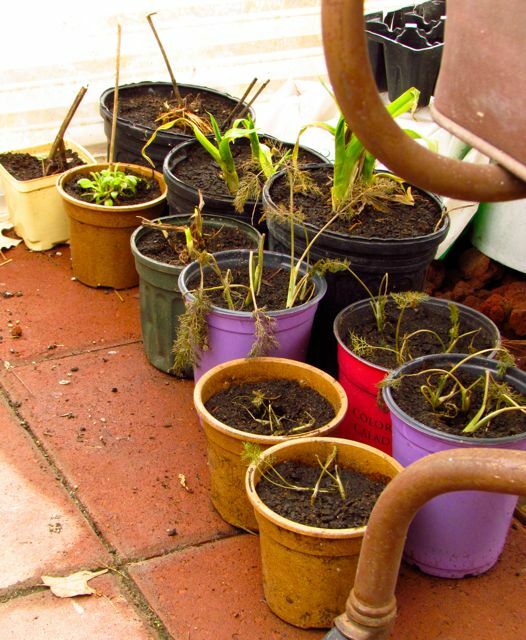 Most folks dip cuttings into commercial rooting hormone — liquid or powder — to encourage stems to produce roots. If I were trying to root more difficult plants, say, cuttings of trees or some shrubs, I’d probably use this product, but I’ve never found it necessary for these herbs. I’ve also noticed that after a few stems acquire roots, the rest of the cuttings seem to root all at once. 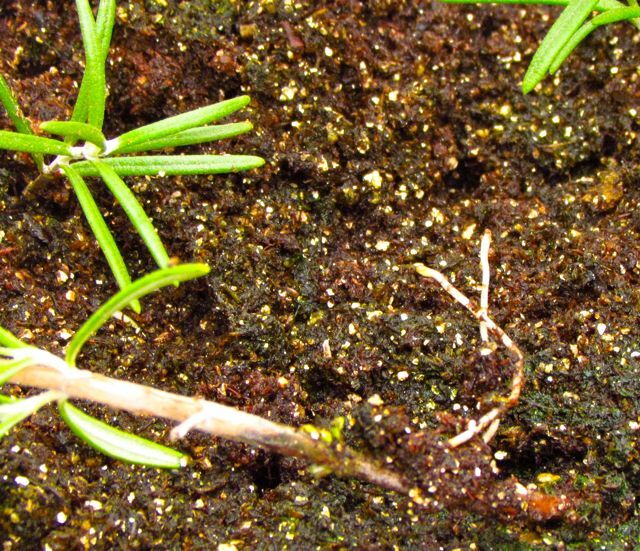 I suspect that the early rooters are putting chemical signals into the soil that encourage nearby cuttings to begin rooting. All the cuttings seem quite healthy, and the rosemaries are blooming like crazy. You’re really not supposed to root blooming cuttings because the flowers theoretically consume too much energy for the cutting to create roots. But my rosemaries apparently don’t know that, and I’m not going to tell them. Herb cuttings seem quite happy in their greenhouse flat. Very soon now, I’ll be starting vegetable seeds in the greenhouse. Rain — perhaps even significant quantities — is predicted for my region over the next few days. My county is in moderate drought, so I’ll welcome every drop. But as soon as the sun returns, I must focus on cleaning up the vegetable garden for spring planting. Ready or not, elbow, here comes spring! This entry was posted on February 7, 2013, 2:31 pm and is filed under Greenhouse growing, piedmont gardening, Tools & Techniques. You can follow any responses to this entry through RSS 2.0. You can skip to the end and leave a response. Pinging is currently not allowed.